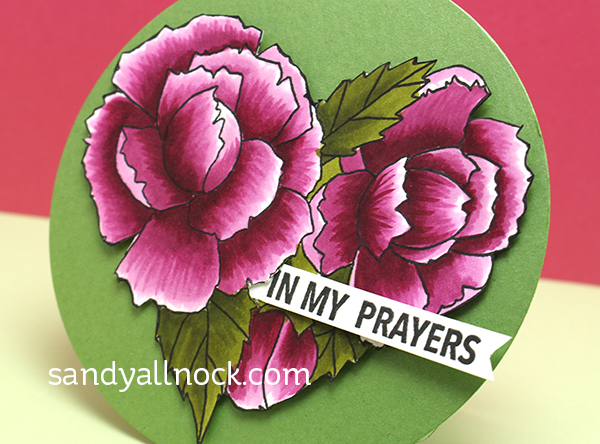 Flowers, flowers, flowers…..there are SO many flower stamps! And today I’ll show you how to color this pretty heart full of flowers – in 3 Copic colors I don’t use often. Watch the video below or click HERE to see it in HD on YouTube. I’ll look forward to the first weekend of each moth. Your newsletter is great! I enjoy your videos. Thanks for the inspiration and for sharing your talents. I love your NEW newsletter. It is going to give me a chance to see any cards I may have missed and a bit of info about what is going on in your world. I am NEW to copic markers. Your Tim Holtz Crazy Dog & Crazy Cats card drew me to your site. Knew I needed your Jump start class after watching you color the dogs & cats. Love the ability to go back and forth in the class.Thank you for sharing. Love the NEW newsletter. It is a reminder to get busy on my classes that I have signed up for and have not completed. I get the staying busy part and realize I am missing out on doing things for myself. I am very involved with my job, but it pays for supplies. I am very involved in my Credit Associations (I am a Commercial Credit Manager). Making cards, painting, doing art is so relaxing for me. The more I do it the better it is getting. Who ever thought. Mr Lathrop my Art Teacher from 7th through 9th grade would be very proud of me. And thanks to you Sandy and the Frugel Crafter(I am not frugel though with supplies. I want them all), I have found my art interest again. Thank you!! Fab first NEWsletter, I learned something NEW about Toastmasters, will check them out. Thank you for sharing so much of yourself, not just the colouring bit. What really convinced me to sign up to your blog was your intro for the craft room tour, very refreshing , honest and unique view, never heard that from anybody else, not that I watch many craft room tour videos. So keep up the good work Sandy, I’ m a convert! Hi there Sandy!! I’m a NEWBie to copics and just love your work. I’ve been so inspired by all your artistic talent, that I’ve decided to venture out of my crafting comfort zone and am going to try water colors! Thanks for sharing your talents!! I like your NEW art classes website! I can’t wait to sign up for a class, Sandy. Just wish it was in person again like last year at P & P.
I am a NEWbie to most everything in the art world, except the appreciation part, since I was a music nerd growing up. I can’t wait to someday experience the feel of my first NEW copic marker in my hands. But until that day comes I’ll be enjoying and appreciating all the NEW content, NEW NEWsletters, and NEW and amazing talent that you share. Thanks for helping this NEWbie! 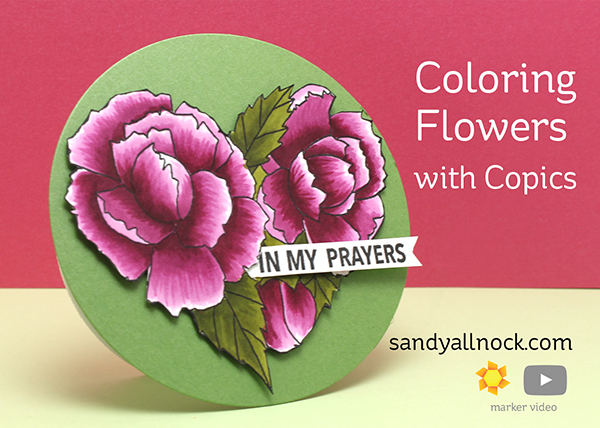 Sandy, I just love the colors in these flowers! You are such a great artist in all you do! ❤️ all of the NEW ideas that you give us!! I think the NEW NEWs letter will be fun. It’s always interesting to hear what you are doing away from youtube and blogging. I will just stand over here and watch you whirl around. Goodness. Do you sleep? Keep up the great work.